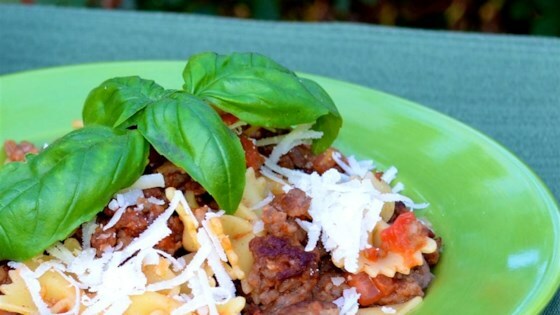 "Ground beef and bow tie pasta cooked in garlic, Italian seasoning and tomatoes." Fill a large pot with lightly salted water and bring to a rolling boil over high heat. Once the water is boiling, stir in the bow-tie pasta and return to a boil. Cook the pasta uncovered, stirring occasionally, until the pasta has cooked through, but is still firm to the bite, about 12 minutes. Drain well in a colander set in the sink. In a large skillet over medium heat, cook the ground beef until browned and crumbly, about 10 minutes; drain off excess fat. Stir in garlic and cook for 5 minutes, stirring frequently. Stir in tomatoes, salt, and pepper. Cook, stirring occasionally, until tomatoes are soft, about 5 minutes. Place the bow-tie pasta into a large serving dish, and pour the ground beef mixture over the pasta. Sprinkle on the chopped basil. Toss lightly to combine, and sprinkle with Parmesan cheese before serving. Quick and Easy recipe, and cheap as well. I also added in some spinach and it worked out nicely. I added zucchini but otherwise followed the recipe. My ingredients were very fresh, tomatoes and basil right out of the garden. I found this dish lacking in taste and will not make again. This is one of my go to recipes on those crazy week nights. My family enjoys! Quick, easy, but as is a bit bland. Next time, I'll add some crushed red pepper and a bit more salt. this was really good and very quick and easy, great for a busy weeknight supper. I followed the recipe exactly using fresh tomato, garlic and basil. Even my picky 10 year old liked it. Still cannot believe there is no oil or sauce in this which is a good thing for the calorie conscious. One can taste the "fresh" and maybe some sliced mushrooms and onions would only add to it.